Audi began teasing the new generation of the A7 Sportback little while ago and with much excitement its global premiere has happened last Thursday. It is sporty in appearance and retains the signature road presence. 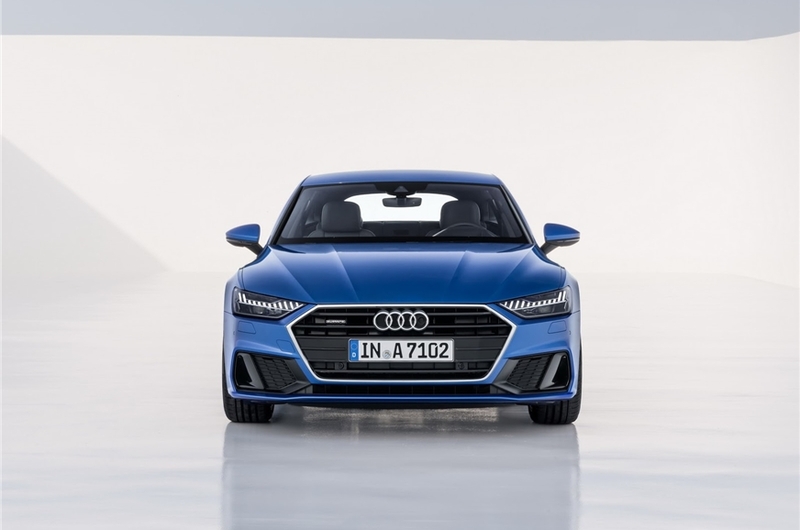 The new generation Audi A7 Sportback comes adorning an evolutionary approach to design language and has its styling cues taken from the well-known Prologue Concept that was showcased at the last edition of Delhi Auto Expo. Underneath the lavishing skin though, what you will find is a MLB Evo platform. The new A7 Sportback comprises of a wide single-frame grille flanked by unique headlamps and aggressive air intakes. The distinctive styling continues with a sculpted hood, bold character lines, and flowing sporty roofline. The rear end is said to be “tapered like that of a yacht” and gets an integrated spoiler that automatically extends at 120 kmph for additional grip and better aerodynamic performance. A full-length light strip consists of 13 vertical segments for various light animations and it is inspired by Bugatti Chiron. The underpinnings are shared with several other models from Audi range including the range-topping Q7 SUV. The 2018 Audi A7 Sportback will be offered in different choices of petrol and diesel engines and will be headed by the performance-spec RS7 that is good enough to stand toe-to-toe with some of the dedicated sports cars. The A7 Sportback is expected to stick with the same 4.0-litre twin turbocharged V8 engine pumping out more than 600 horsepower in its top-spec trim. The chances of the new A7 Sportback adapting plug-in drivetrain cannot be ruled out either while it could boast semi-autonomous driving technologies. As for the interior, it has a premium cabin with the use of high quality materials and leather upholstery and highly desirable in-car connectivity. Important technologies include Audi virtual cockpit, head-up display, Bang & Olufsen audio system, driver assistance systems including Audi AI, Valcona leather upholstery, adaptive cruise control, voice control technology, ambient lighting package, etc. With the use of cameras and sensors, the A7 autonomously maneuver in and out of parking spaces. Initially, the A7 will be offered with a 3.0-litre TFSI turbo V6 petrol engine that makes 340 PS and 500 Nm of torque. It is mated to a seven-speed S tronic transmission and a quattro all-wheel drive system that helps accelerate from 0-100 kmph in 5.3 seconds before hitting a top speed of 250 kmph. It also comes equipped with optional dynamic-all-wheel steering system and a choice of four different suspensions including a conventional steel spring suspension, an updated air suspension, progressive steering system with “sporty ratio” and sport suspension that reduces ride height by 10 mm. The new A7 Sportback will be introduced in Germany early next year with pricing starts at €67,800 (Rs. 52 lakh approx).